Two more frescoes show historical events and figures. 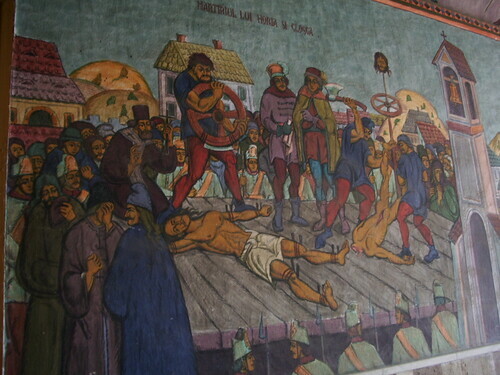 The top one depicts the execution of Horia and Closca, who led a revolt in 1784-5 against the lack of political equality between the Romanians and other ethnicities of Transylvania. The bottom one shows Constantin Brincoveanu who was Prince of Wallachia (one of the provinces which eventually became part of modern-day Romania) between 1689-1714. Under his rule a style of architecture known as the Brincovenesc style flourished, a synthesis of Renaissance and Byzantine architecture. He was a great patron of culture and was eventually executed by the Ottomans, supposedly for refusing to convert from Christianity to Islam. 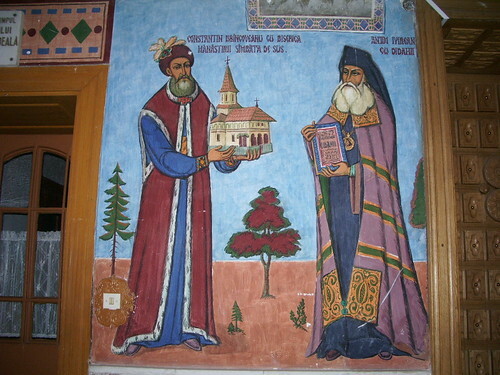 His tomb is now at the Sambata de Sus monastery in Brasov county – this fresco depicts him handing the newly-built monastery to the church.